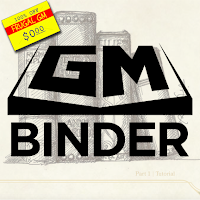 The GM Binder is "a tool for you to create and manage your favorite tabletop RPG documents". 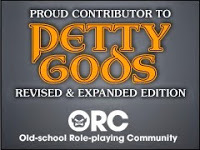 You have to register for an account and the team behind GM Binder is up-front about wanting to offer this as a paid subscription....eventually. For now GM Binder is free and actively managed. There is a reddit for alerting folks of updates and if you want to provide a little more support there is a GM Binder Patreon. While Homebrewery was aimed more at helping GMs make their own pages that thematically look like "official" D&D documents, the GM Binder is geared towards making useful documents in addition to "pretty" ones. A quick look at the Patreon page has the team's road map for future (and completed) upgrades in functionality. I can speak from experience that creating RPG documents can be a royal pain in the.....dice bag. Unless you want to spend hundreds of dollars on software like Adobe InDesign, and a lot of time learning how to use it.....or in my case re-learning how to use it.....well, GM Binder can quickly look like a more attractive option, especially at the current price of free. One of so many great posts on here. I inducted you into the Blogger Hall of Fame on my podcast/blog this week. Thank you for all you have done over the years for GMs.